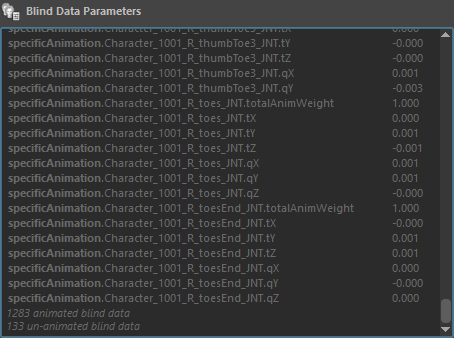 Golaem animations files (.gmo) can store more than the golaem converted animation, it can store the full source animation values (rotations and translations) in blind data. specific animation blind data will only be replayed on unmapped parts of the skeleton. But it's also possible to mix Golaem animations with blind data animation by mapping the parts of the skeleton that should be golaem animated and letting parts that should be animated by blind data unmapped. It's then possible to only map the legs of a character to ensure it will be possible to ground adapt it, but let a tail or any other bone chain unmapped to ensure it'll replay the exact source animation by using blind data. Storing the source animation in Blind Data. To store the full source animation in Blind Data, check the "Store full source animation in blind data" option before importing the motion during the motion file creation process. Using the source animation stored in Blind Data. To use source animation blind data the blind data channels needs to be activated on the EntityType AND on the MotionBehavior. Blind data channels are deactivated by default on EntityType to preserve performances. When this is checked, any source animation used in Motion or Locomotion Behaviors will automatically be replayed on unmapped parts of the skeleton. Blind data channels are activated by default on MotionBehavior (because if they are deactivated on EntityType, anyway it will have no impact on performances).